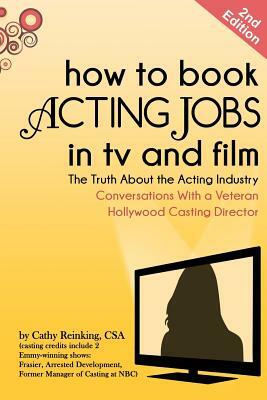 How to Book Acting Jobs in TV and Film: Second Edition: The Truth about the Acting Industry - Conversations with a Veteran Hollywood Casting Director (Paperback) | The Drama Book Shop, Inc. I have been working in Hollywood since the early '90s, working on "Frasier," "Arrested Development," "According to Jim," and many other shows, pilots and films. I also served as NBC's Manager of Casting and hold a degree in theatre arts from UCLA. I've been a member of the Casting Society of America for 14 years. Commercial Clients with Reinking-Gregory Casting include Nike, Subway, Honda, IBM, Duracell, Boston Market, Colorado Lottery, Dish, and many, many others. Currently the casting director and rights associate at LA Theatre Works. I also coach corporate executives and salesmen who benefit greatly from my Top Ten Secrets of Charisma. If you haven't tried Charisma Coaching yet, you're in for a transforming experience. Being a superior communicator is not just about confidence or knowledge, "moving people" is also about Vulnerability, Humility, Concentrating on the Other Person . . . and 7 other secrets learned in Hollywood. Oh, and I was actually born in Hollywood. Yep, a true native. But I have lived and worked all over the country so have a true perspective on what it means to work in smaller markets as well as the "Big Time."